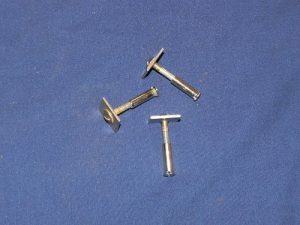 This clip set is a 3 piece set of square head “T” bolt type clips with chrome specialty nuts that holds the center divider of the 2 piece windshield in place on the 1949-1952 Chevy cars. The “T” bolt fits into the outside stainless molding while the chrome specialty nut fastens through the 3 holes in the inside garnish molding. That is the inside piece between the 2 windshields. This clip set is a new reproduction set and is of excellent quality. 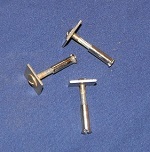 This set is an exact reproduction of the original GM clips used for this application.